Last year was safer in Prince George's County, its leaders say. Prince Chief Hank Stawinski and County Executive Rushern Baker announced Monday that violent crime dropped 6.6 percent in 2017, compared to the previous year. Eighteen fewer people died in homicides, and thefts from cars dropped 4 percent. 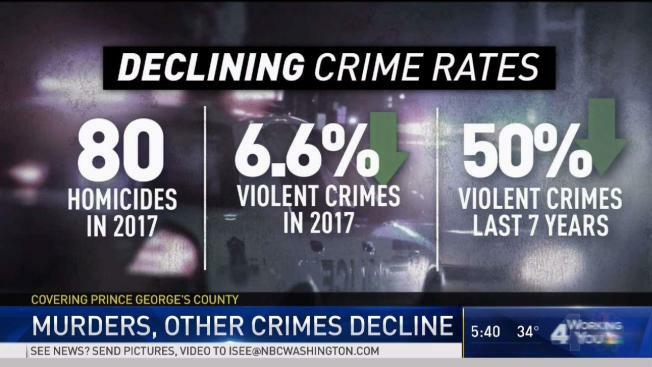 The drop in violent crime represents a more than 50 percent decline in the county over the past seven years, police said. Stawinski attributed the drop to solid police work. "That's the product of men and women going out on the streets on Prince George's County, day in, day out, and working to prevent crime in the first place," he said. The officials said at a press conference that the county executive, police and prosecutors had worked together to make the county safer. "Today is not 'mission accomplished.' Today is not to say that we have solved the issue of crime, but to say that we have solved the issue of partnerships," Prince George's County State's Attorney Angela Alsobrooks said.